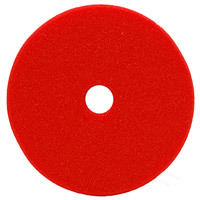 Buff and Shine Red Uro-Cell Pads - for final finishing and wax/sealant application. These pads are made of dense finishing Euro foam that yields great chemical dispersion for even results. The pads have low "mechanical" ability, meaning they produce minimal action on the paint. Thus they are excellent for final finishing using finishing or swirl-removing polish, without worry of adding any swirls or orbital haze. They are also excellent for applying protective products like wax or sealant to the paint surface once the buffing and polishing steps are done. By nature of their manufacture, all URO-CELL foam pads have high tensile strength, which means they are highly resistant to tears and break-down. You will find that these pads last longer than other pads you might have used. And, of course, because Buff and Shine uses only high-performance adhesives, separation of the foam from the backing material is not likely, even with extended use and multiple washings. 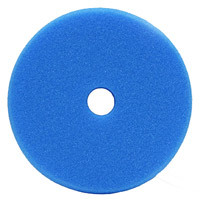 One note of caution: with rotary (high-speed) polishers, you might notice a bit more sling than you are used to with other pads. Again, this is because the pads are not absorbing product. The simple solution for this is to start with far less chemical than you normally do. You will notice that the product-pad combination still gives you increased performance, even though you are using less chemical. Thus, you are saving money in chemical costs! It will just take a small adjustment time for you to figure out the proper amount of chemical to use with these pads in order to reduce or eliminate sling. 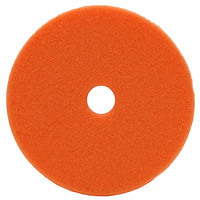 NOTE: 6 inch Buff and Shine Uro-Cell Pads have a 6 inch face diameter with a 5 inch back diameter - a 5 inch backing plate should be used with this pad. Home / Collections / Buff and Shine / Buff & Shine Uro Cell Foam Pads 6"